Darkstar2 wrote: Good job with tasks, it's great to have the tasks when surveys are low - do you do the casino tasks, you can get a quick and easy $0.50-$1 daily from those alone. no i don't have casino task. i used to have some of those casino task before but now i don't get it anymore. i only work with some survey task but mostly on Financial Survey/Fisher Task that pops up every now and then through out the day thats why i just keep refreshing the task page to look for some work. Darkstar2 wrote: That is amazing that you managed to kill in the offers today , good catch ! yeah i try to check most of the Offer Wall since there is less Survey today. some video, sign-up, click offer and been able to manage to qualify for some surveys as well. every pennies adds up. Merry Christmas! Thanks and Admin! whew a great day indeed! plus an additonal bonus from task! Thanks and Admin for this great opportunity!!! Good Decision! just always try to complete the daily checklist for higher percentage of bonus. serenity0718 wrote: Congratulations If you don't mind me asking, how many referrals do you have? Or are those all your own earnings? i think he did it on his own. as you can see from his profile he doesn't have any referral or did any task at all. just all from offer. SentinelOnyx wrote: You are really rocking the offers in Clixsense. I wish that offers are available in my country. Congratulations on really insipiring payout. Forever_Love wrote: Wow! Great Stats! zerohdcp wrote: Very impressive stats !! dianejoy8 wrote: Congratulations, Keep it up. SentinelOnyx wrote: Nice numbers. Good luck in the future! missbarbara wrote: Great job! I wish there were more surveys avaible here. ...Thanks for all your kind words. Wish us all more success with ClixSense! Keep Clicking!!! Great day to do some Offers and Completing Daily Checklist with a nice Bonus! PTC Clicks: I do click each and every ads that is available for me. As you can see i already earned over $100 of earnings just by clicking ads. It already pays off for my Premium Account which is just $17 a year. 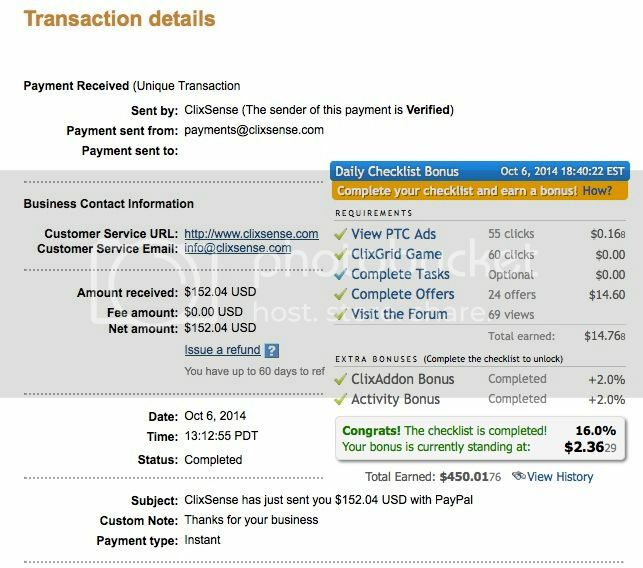 A very small payment compare to other PTC Site. 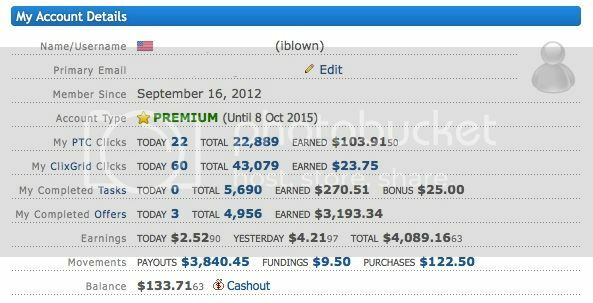 ClixGrid Clicks: I do click every opportunity i have. So far the highest winning i had is $5. Tasks: I do task once in a while only if it is easy and don't require too much work. And i already get $25 bonus just from those task. Offers: This is where i mostly generate my earnings. By doing Sign-Up Offers, Watching Videos, and SURVEYS! Lucky for me i live in US where surveys are plenty. I am like everyone else that take surveys, some days are good and some days are bad. If i don't qualify for one just go ahead for another one. Referrals: I do have a few but they are all NOT-ACTIVE! I do still invite other people to join ClixSense. It is just a Plus in earnings having active referrals. All in All i can say ClixSense is the BEST! Small Payment for being Premium and will give you 16% of bonus just by completing your Daily Checklist. Long Live ClixSense and More Years to Come! Keep Clicking!! !